Last month, when Maersk Line ended its emulsion fuel trial with Quadrise Fuels International plc (Quadrise), the indications were that the world's biggest box carrier looks likely to favour switching to low sulfur bunkers to comply with the 0.50 percent global sulfur cap on marine fuel coming into force in 2020. 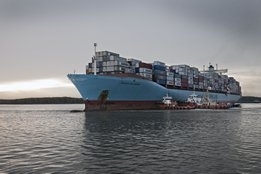 Niels Henrik Lindegaard, Head of Maersk Oil Trading, has now confirmed this decision to Ship & Bunker and explained why the company has discounted using scrubbers and continuing to burn less expensive, high sulfur HFO bunkers. "For Maersk, it is of utmost importance to secure broad industry compliance for the 2020 Global Sulphur Cap. We have looked into existing and future solutions and concluded that we will secure compliance, not by scrubbers, but through the use of alternative fuels," Lindegaard told Ship & Bunker. "In our opinion, scrubbers will not be the way forward for our fleet. Whilst the business case for investing in scrubbers may look appealing at first, it is not a long-term solution to place such complex machinery on our vessels." Lindegaard says scrubbers require high maintenance and specialised personnel for a "relatively mitigated" health and environmental result. "Moreover, scrubbers, by allowing the continuous use of cheaper fuels, may in addition ruin any kind of broader business case for enhancing energy efficiency," he added. "Maersk consequently prefers to take a longer-term approach to secure compliance through the use of alternative fuels. Only this will ensure a swift and effective compliance for the 2020 Global Sulphur Cap." Maersk are one of only a few major shipowners to date to have made a clear statement on their 2020 compliance plans. Others include Hapag-Lloyd, who this week told Argus Media it too has ruled out the use of scrubbers in favour of an alternative compliant fuels approach. And in comments reported by Motorship from their 39th Propulsion & Emissions Conference, taking place this week in Hamburg, Mitsui OSK Lines (MOL) did not rule out the use of scrubbers but said it was "impractical" to fit them to its entire fleet. At the same conference it was reiterated that Carnival Corp has taken the opposite stance and fully embraced scrubbing technology. As Ship & Bunker reported earlier this year, the cruise giant recently completed scrubber installations on 60 of its vessels. As the debate continues as to what others will do, "wait and see" is already becoming a familiar phrase across all parts of the supply chain. "We can only react to what the market does, but what we're expecting is a wait and see approach from shipowners," Mark VandeVoorde, Managing Director, GCC Bunkers recently told Ship & Bunker. "While what will happen is by no means clear, what is becoming increasing clear is that relatively few people will take a proactive approach to 2020."